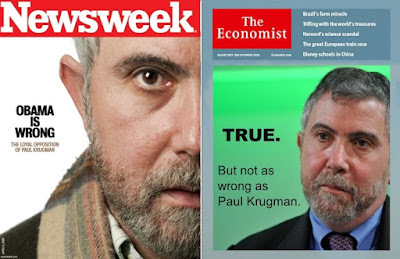 The Dividist Papers: Krugman and Klein on how the Scalia Supreme Court vacancy battle will destroy America. 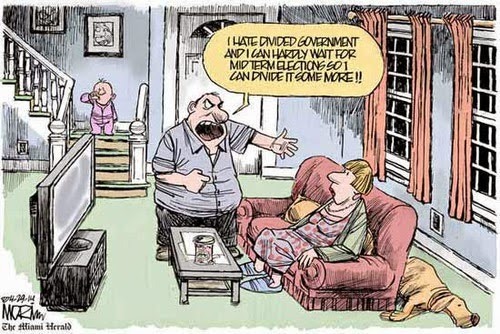 Because "divided government." Or something. Krugman and Klein on how the Scalia Supreme Court vacancy battle will destroy America. In his opening paragraph, in around 50 words, Krugman manages to blame the GOP for "chaos", a "constitutional crisis", and losing America. 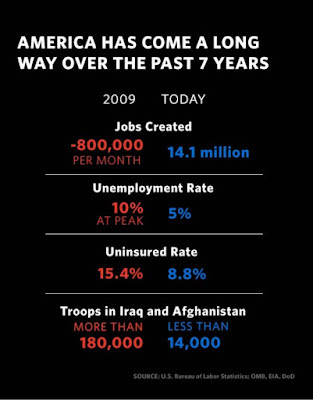 All because the GOP controlled Senate may delay confirming a Supreme Court appointment for 9 or 10 months. 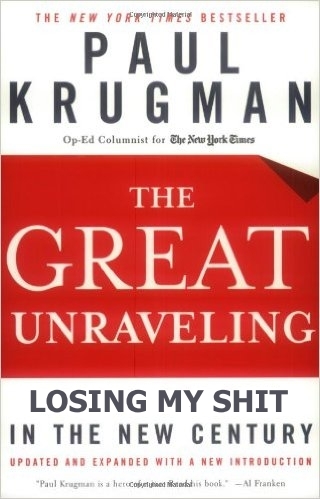 Even by the standard of Krugman's usual vitriolic, polarizing, partisan hyperbole, that is an impressive pile of horseshit. "Barring a huge upset, Republicans will take control of at least one house of Congress next week. How worried should we be by that prospect?.. This is going to be terrible. In fact, future historians will probably look back at the 2010 election as a catastrophe for America, one that condemned the nation to years of political chaos and economic weakness... 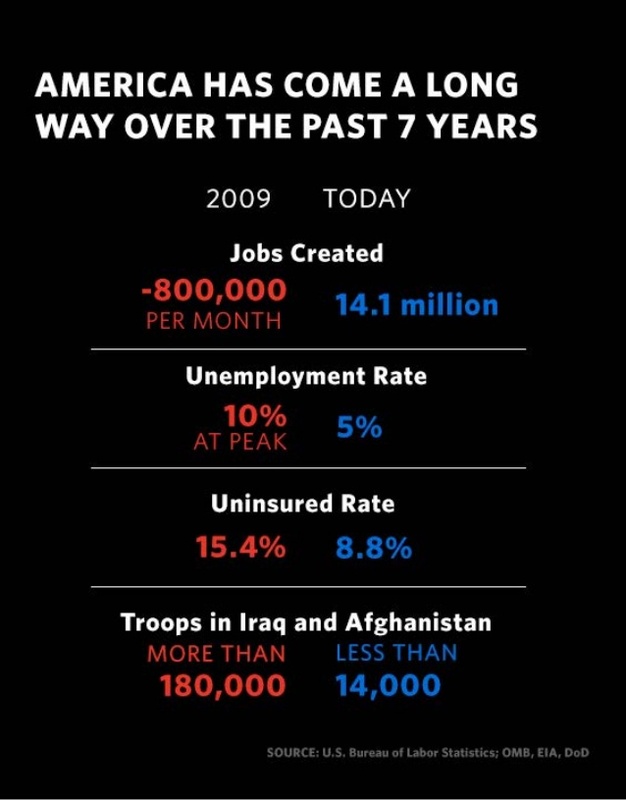 Right now we very much need active policies on the part of the federal government to get us out of our economic trap... So if the elections go as expected next week, here’s my advice: Be afraid. Be very afraid." 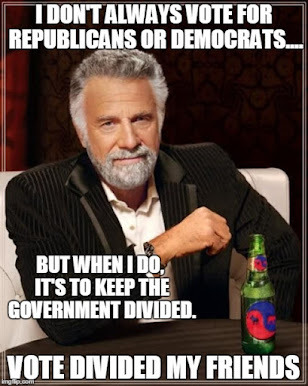 majority control of the House and divided the government in 2010. But, we've come to expect this from Paul Krugman. The real surprise is when he gets anything right. There have been no surprises in recent memory. The great unanswered question of American politics in this era is whether our divided political system can function in times of stress. Already, there have been worrying signs. Disagreement between a Democratic president and a Republican House nearly forced the United States to default on its debt in 2011, and it shut down the government in 2013.Now we see another form of stress — how does a divided political system, where the disagreements are sharper than ever, fill a Supreme Court nomination? Divided government is a common occurrence in American politics. It didn't used to signal disaster for the system's ability to solve problems. If it does so now, then the country will, over time, pay a serious price for a political system that no longer fits its political parties." Just to be perfectly clear - Ezra Klein is saying that after 240 years, after two world wars, a great depression, two impeached Presidents, a President resigning in disgrace, our capital burned to the ground by invading Brits, and fighting a civil war where we spent four years killing 600,000 of our fellow citizens... after surviving all that... This is what is going to bring down our constitutional checks and balances, separation of powers, divided government system - Wait For It - The catastrophe that finally does us in is a potential 9-10 month delay in the Senate confirming a vacant seat on Supreme Court. Well, it was a good run while it lasted. There is another possible explanation. Our system has been this successful, and lasted as long as it has, not by accident, but because it is unique in the way it was designed. It is not just another "presidential government" as cited by Linz and Klein. It is a system designed by the Framers to prevent the centralization and consolidation of power at all cost. It is unique with a bicameral legislative body and separation of the executive from the legislative branch with an independent judiciary. It is designed to pit power against power. There is nothing else like it in on the planet. That continuous conflict makes it more resilient because power cannot be centralized and consolidated. And, just perhaps, as the 240 year evidence would indicate, this system of what historian Joseph Ellis calls the "enshrinement of argument" is incredibly resilient. This conflict and concept of pitting power agaisnt power is the very reason our system has survived for as long as it has and precipitated the exceptional success our country has enjoyed. H/T to Karl at HotAir for posting this gem. "I hear Americans saying this nowadays, and there’s a lot of it going around. They talk about a dysfunctional government because there’s disagreement… and the Framers would have said, “Yes! That’s exactly the way we set it up. We wanted this to be power contradicting power because that's the main ill besetting us — as Hamilton said in The Federalist when he talked about a separate Senate: “Yes, it seems inconvenient, inasmuch as the main ill that besets us is an excess of legislation, it won’t be so bad.” This is 1787; he didn’t know what an excess of legislation was. I'll add that the gridlock is also there so that the SCOTUS appointments that do get out are good SCOTUS appointments. Thank you Justice Antonin Scalia. Nearly all the economic success is due to the fed. And taking fsr too many soldiers out of Afghanistan is nothing to be proud of. It caused the formation of Isis.